Have you been putting off your next dive because you can’t locate your PADI certification card? Chances are, it’s been a while since your last dive and you need to refresh your scuba skills. When you take the all-new PADI ReActivate course, you can do both! Designed to give divers the confidence to get back in the water, PADI ReActivate will refresh the fundamental scuba skills you need to jump back in. You can purchase the ReActivate class for your tablet or mobile device here. Once you have completed ReActivate on your tablet print out the completion form and schedule your private pool session with us. You will need the equipment minimum of mask fins and snorkel. 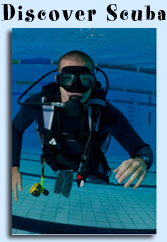 We will provide tank, regulator, gauges, BCD and weights. If you have your own scuba gear you are encouraged to bring it with you. Reactivate pool training is $125.00. If you complete both the knowledge and in-water skill refresher you will receive a replacement certification card with a ReActivated date on it.